Worshipful Brother Roger Cole was born on the 1st April 1940, where he lived in Lostwithiel. After leaving his local school he went and studied Mechanical Engineering at Camborne College, where he gained a National Diploma. In 1960 he moved to Birmingham to take on an Engineering Apprenticeship and it was on this placement where he achieved a Higher National Certificate in Mechanical Engineering. This led the way for Roger to join a firm who specialised in making Aircraft and Motor Car components. Roger returned to Plymouth in 1967 working until 1973 as a Production Engineer for the Tecalamit Garage Equipment Company and it was during this period that he joined Restormal Lodge No: 856 He then worked for South West Water for twenty years before finally working for DML for four years. Roger was proposed at the Lodge meeting on the 4th April by Worshipful Brother G.H. Kear PPSGD, the Lodge Treasurer and Seconded by Worshipful Brother A.J. Bazley the Immediate Past Master of the Lodge. Roger was balloted for as an initiate of Restormal Lodge on the 2nd May 1968, when he was aged just 28 years old. His Part P registration form records he was a planning engineer living in Lostwithiel and employed by Tecalimit in Plymouth. His Initiation took place on the 1st August 1968 in a ceremony carried out by the Worshipful Master, Worshipful Brother J. Alan Jones at the Old Duchy Palace in Lostwithiel. The meeting was attended by twenty One Officers, Six Past Masters, Six members of the Lodge and Two visiting Brethen. The Lodge minutes record that Brother Harris gave the Address from the North East Corner, Brother A. Webb presented the Working Tools and Worshipful Brother Kear (Roger’s proposer) delivered the Charge after passing. Following the Initiation the Brethren retired to refreshment at 8.30pm. The retiring collection raised the princely sum of £1.18.6d for the masonic Benevolent fund, about a shilling each. Worshipful Brother David Maskell celebrated his 7th birthday and I was 3 months old. Roger’s first office within the Lodge was as a Steward, being appointed in 1971. On the occasion of that Installation meeting, which in those days and for many years after, was known as St. John’s Day. A “Motor Coach” was hired to convey the Brethren to the Installation banquet at the Hannafore Point Hotel in Looe. From this point Roger’s progress through Restormel was quite rapid. In 1973 after only two years as a Steward he was appointed as Assistant Secretary. The following year as Assistant Director of Ceremonies. In 1975 Junior Deacon, 1976 Senior Deacon, 1977 Junior Warden and then Senior Warden in 1978. 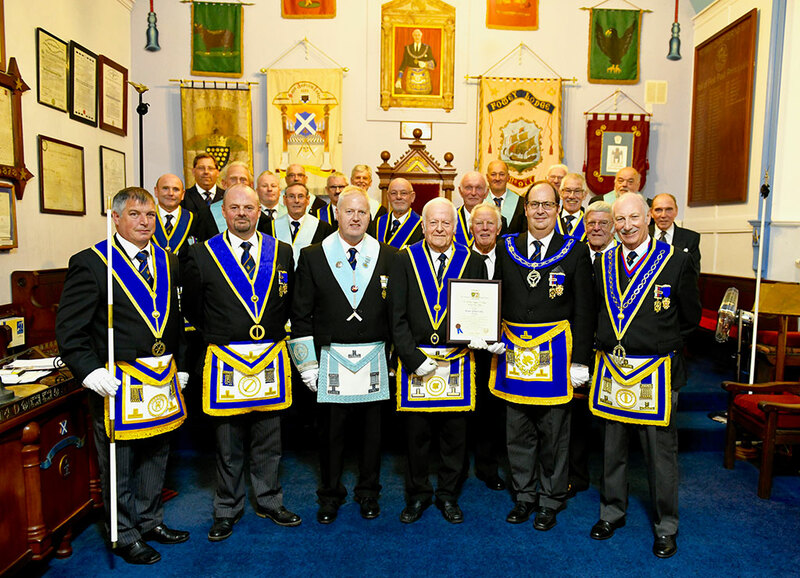 Roger was installed into the chair of Kind Solomon on the 4th of January 1979 by the then Worshipful Master, Worshipful Brother Ernest Sincock. Sadly, due to the atrocious weather conditions the Installation Banquet had to be cancelled as many Brethren and Visitors had advised they would be unable to attend due to many parts of Devon and Cornwall cut off by snow following the great blizzard on New Years Eve 1978. Having now become a Worshipful Brother, Roger went on to fill numerous other roles within the lodge and was Chaplin on two occasions as recorded. First from 1983 – 1986 and then again from 2015 – 2016. In 1986 he was made a Provincial Officer receiving the rank of Past Provincial Junior Grand Deacon, eleven years later he was promoted to the high rank of Past Provincial Grand Superintendent of Works. This year in April 2018 the Provincial Grand Master, Right Worshipful Brother Stephen Pearn was pleased to promote Worshipful Brother Roger to the rank of Past Provincial grand Registrar. Restormal Lodge No: 856 has and will always have a personal bond for him. He has always tried to attend every meeting since he was initiated and it’s only the occasional difficulty of work and severe weather conditions that have hampered this. Roger said: “Restormal Lodge is my Mother Lodge and I will always continue to attend as long as I am well enough to travel. I have enjoyed every moment of being a Freemason and member of the Lodge, which has afforded me the privilege of meeting some incredible men and Masons”. A very special for everyone in attendance and certainly an evening to remember for a long time to come. All that remains to say is sincere congratulations Worshipful Brother Roger, without any question of doubt you richly deserve your 50 year certificate you are quite simply an inspiration for all Freemasons. The Brethren of Restormal Lodge and those members of the Province of Cornwall are honoured to have you amongst their ranks.